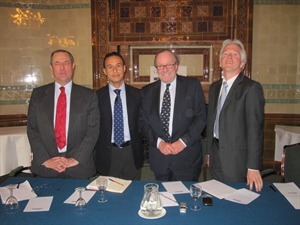 On 28th March, Global Strategy Forum held a lunchtime debate on ‘The Arab Revolutions: Will Democracy Prevail?’ at the National Liberal Club. Speaking on the panel were Sir Richard Dalton, former UK Ambassador to Iran and Libya, Tarek Osman, author of ‘Egypt on the Brink’ and Dr Eugene Rogan, Director of the Middle East Centre at St. Antony’s College, Oxford. The panel agreed that democracy would prevail – but with caveats. Sir Richard Dalton suggested that new leaderships would be pragmatic rather ideological and would respond to events. He foresaw a period of change, reform, instability and even of repression in some cases. He suggested that two actions by the international community would be helpful: firstly, a consistent advocacy of democracy and human rights; and secondly, a generous response to requests to share expertise with civil society and governments. Tarek Osman felt that the unrest in the Arab world was better described as revolts rather than revolutions and that there were five key factors to take into account, particularly in the case of Egypt, namely, the composition of the middle classes in the region; the question of legitimacy and the consent of the people to a government; the strength – or otherwise – of a country’s institutions; the need for an inspirational national project; and the effect of demographics and a very youthful population. Dr Eugene Rogan felt that the answer to the question set was a variegated one – democracy would prevail to varying degrees across the region, with the highest standards of political freedoms achieved by any one country serving as the benchmark for the region. Ultimately, different patterns would emerge across the region with different results – there would be democracies in some countries and trouble in others and the international community needed to maintain a disinterested approach.